1) High light transmission: Up to 88% that of same thickness of general glass. 2) Excellent impact resistance: 80 times that of glass. 3) Weather and UV resistant-properties retained for years: Temperature resistance range is 40°C ~ +120°C, with an ultraviolet coextruded film on the sheet surface. It can prevent the resin fatigue or yellowing caused by the ultraviolet. 4) Light weight: Only 1/12 of the weight of glass of the same thickness. It can be easily cold bent as well as thermal shaping. 5) Flame resistance: High fire performance rating is class B1. 6) Sound and heat insulation: Superb sound insulation for freeway barrier and super thermal insulation save energy. 7) An engineering plastic of excellent integration capability. It has outstanding physical, mechanical, electrical and heat capabilities. UV co-extrusion coating can prevent the resin fatigue or yellowing effectively by ultraviolet ray . And it help the sheets transfer into the visible light. 2. Roof light for office buildings, department stores,hotels,villas,stadiums,schools. 4. Sound absorption wall for freeways,express ways,high-speed ways. 5. Indoors swimming pools,sun bath pools,greenhouse roofs and sidings. 6. Subway exits,parking lots,garage tents,bus stops,terminals,shopping arcades. 7. Large stadium and rain tents,pagodas,hallway tent. 8. Robbery counters in banks,jewelry counters and police anti-riot shields. 9. Satety roof light for airports and plants. 10. Sign boards for advertisement, sky light cover. 11. House glasses,indoor partitions,sidewalk,sight window,sunshade,terraces and shower doors. Both sides with PE film,logo on the pe film.Other package are available based on customer's requirement. within 7~10 working days after receiving your prepayment. 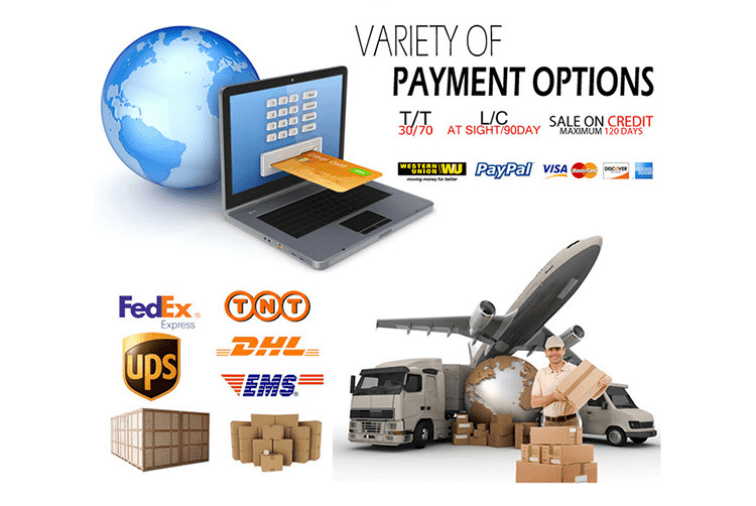 Payment: L/C, T/T, Western Union;Paypal; 30% deposits; 70% balance before delivery. 1.What kind of a company we are ? We are a manufacturer located Hebei, China. We have gained good reputation among our customers for our professional, warm and thoughtful service, Because we know that a long terms business based on the quality control, delivery time etc. 2.Is your company a factory or trade company ? We have a factory ourself , we are on this business for few years in China.Our factory is very famous in the Hebei China. 3.What's the quality assurance we provided and how do we control quality ? 1) Established a procedure to check products at all stages of the manufacturing process - raw materials, in process materials, validated or tested materials, finished goods, etc. Besides, we have also developed a procedure which identifies the inspection and test status of all items at all stages of the manufacturing process. 2) 100% inspection in assembly lines. All controls, inspections, equipment, fixtures, total production resources and skills are inspected to ensure they consistently achieve the required quality levels. 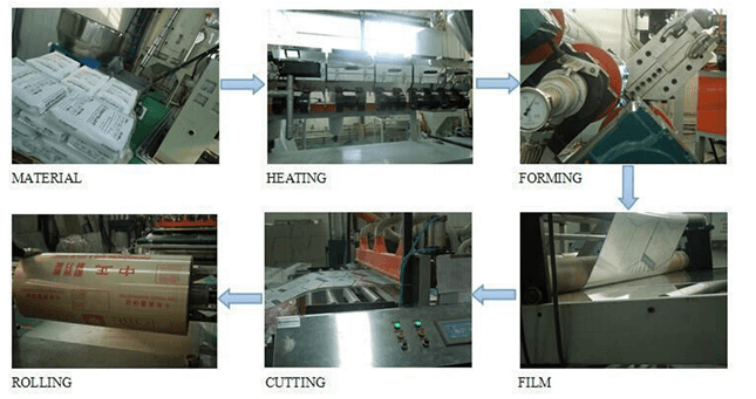 4.How many different kinds of PC sheet can your company produce? 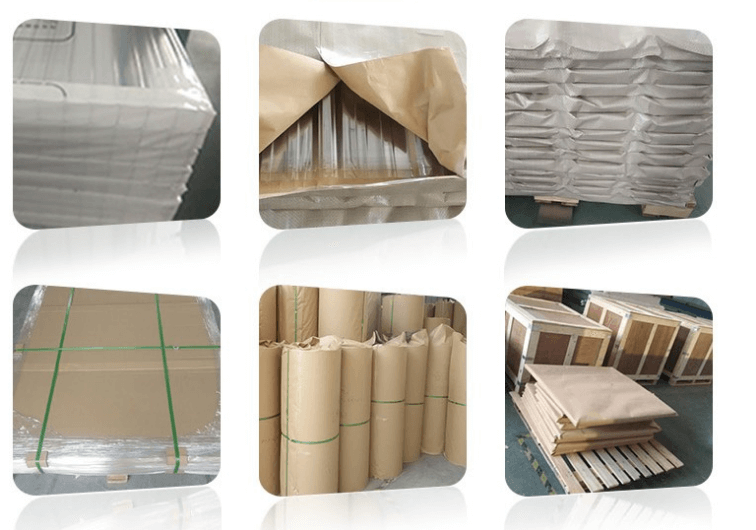 Our company now have following several products: Glittering Polycarbonate Sheet,Multi-wall Structure Polycarbonate Sheet,Greenhouse Polycarbonate Sheet, General Polycarbonate Solid Sheet,Advertising Polycarbonate Sheet,Polycarbonate Embossed Sheet, Polycarbonate Frosted Sheet, Soundproof Polycarbonate Sheet, Greenhouse Polycarbonate Sheet etc. 5.Do you take special orders ? Polycarbonate sheets are a transparent, synthetic product. Because of its exceptional impact, weather and temperature resistance, it provides solutions where other synthetics fail. Polycarbonate has a different chemical composition, and therefore different properties, from other transparent plastics such as PVC. 7.Can I install polycarbonate sheets myself ? 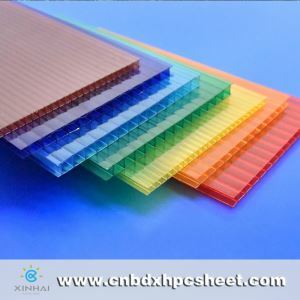 Polycarbonate sheets are particularly user-friendly and very light, so that fewer cross bars are needed. This makes the supporting structure more straightforward and cheaper. 8. Won’t a polycarbonate roof make things very hot? Polycarbonate roofing sheets come with an energy reflective coating, which helps solve this problem. Moreover, polycarbonate sheets have excellent insulating properties so that heating costs are considerably reduced during intermediate seasons. 9. Do the sheets break very easily? weather resistance they have a much longer service life. 10.Is polycarbonate sheet bad for the environment? Polycarbonate sheets are a very sustainable material that can be recycled and does not emit toxic substances during combustion. Moreover, there are sustainable polycarbonate sheets being manufactured using 20% renewable energy! 11.What will happen in the event of a fire ? Fire safety is one of polycarbonate's strong points. 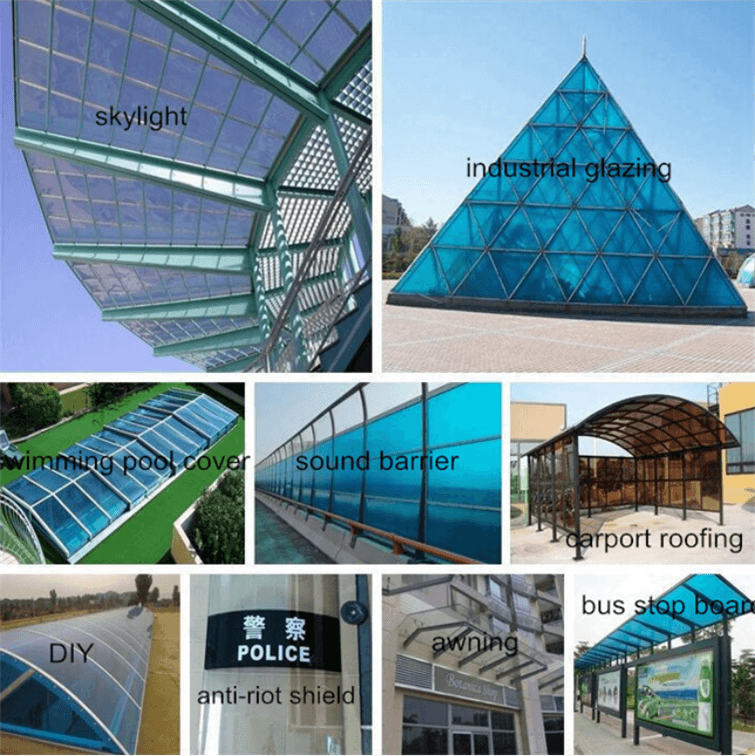 Polycarbonate sheeting is flame retardant and do not emit toxic substances, which is why they are so often incorporated in public buildings, where the most stringent safety regulations apply. 12.What is the impact strength of polycarbonate ? Polycarbonate is almost unbreakable. It is many times more impact resistant than any other transparent material used for glazing or roofing purposes. Many types of tests are used to measure impact strength, so it is difficult to compare data. Solid polycarbonate sheets comply with most tests issued on the impact strength of glazing materials. To give an idea: a 3mm solid polycarbonate sheet withstands the force of a steel ball of about 4 kg dropped from a height of 9.5 m,3 times in a row. It does not break or shatter! When you take a look at some of the more industrial applications, you will see that polycarbonate is used for machine glazing, police riot shields, ice-hockey rinks...all applications that require extreme impact resistance.